There are 8 different lines that can take you just about anywhere you want to go. Just buy your tickets (bilety) at a corner newsstand kiosk or directly from the driver if it’s a week-end. One ticket is good for one ride (one stop or all the way to the end of the line). Cost? 3.00 zloty during the week or 1.50 zloty on week-ends. With the current conversion rate to US dollars, that’s only 79 cents weekdays or 39 cents on the week-end. Can’t beat the price! They run often so you don’t have to wait long and a lot of stops have electronic boards to let you know when the next tram is coming and it’s destination. Just get on, stamp your ticket and grab a seat! It’s on the honor system…I haven’t seen anyone check for tickets yet. But you can get in lots of trouble if you don’t have a ticket….or so I’ve been told repeatedly by my husband. I’m not sure why he thinks I’m going to ride with no ticket…. There are buses too — I haven’t ridden one yet, but when David “walks” to work, he walks and then takes a bus for the last part because he doesn’t like to walk “up the steep hill”. hmmm…lazy perhaps? 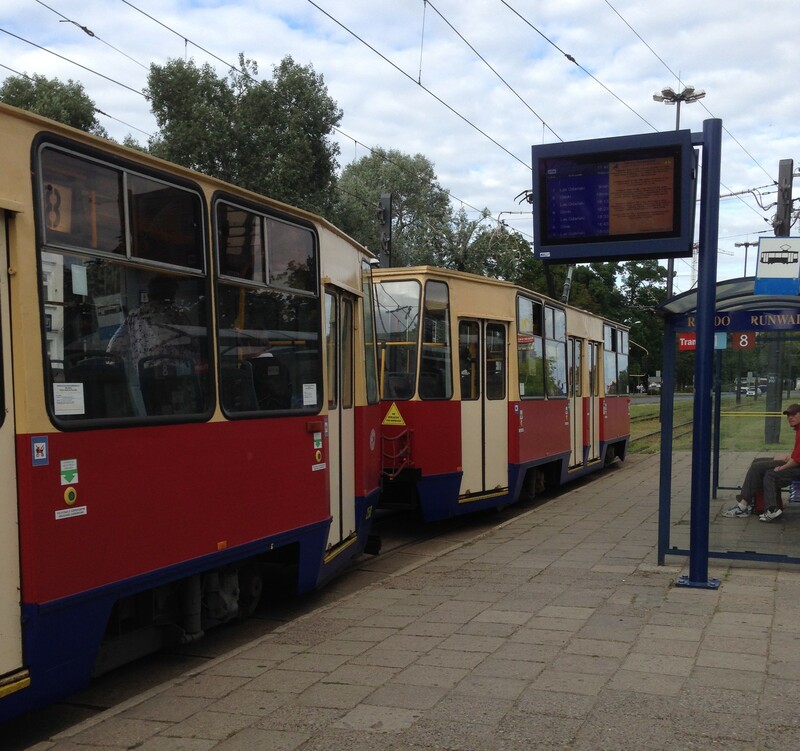 A lot of the buses go the to same places as the trams, but they also go farther out of town. During the summer (May-September), there are water trams (taxis) that go up and down the river. They are solar powered…probably why they only operate in the summer. And who wants to ride when it’s freezing cold anyway? It would make for a relaxing ride home in the afternoon after a long day at work…just cruising the river. Or if you just want to be a tourist….you can ride too just for fun. And if you feel like you’d like to get in a little exercise (but not the walking kind)….you can rent a bicycle and ride around town. 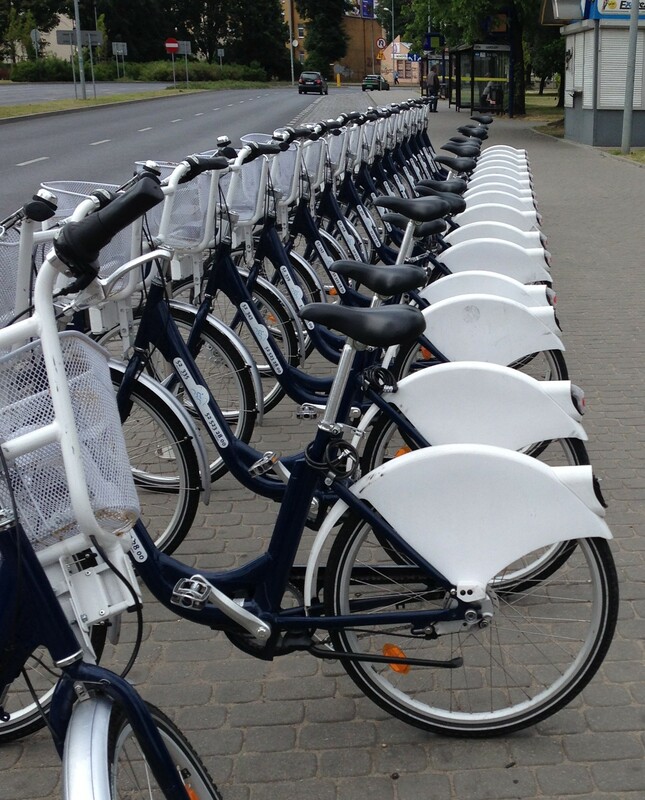 It’s called Biking Bydgoszcz and it’s a self service bike rental system. There are 31 bicycle racks and 310 bikes located all around town. Before you rent one, you have to have a BRA (no not that kind of bra…)…a BRA card that is. It’s kind of like an E-Z pass for bikes. They provide a code to “unlock” the bike. When you’re done riding, just return it to any bike station. If you return it within 20 minutes, your ride was free! That’s plenty of time to throw your purchases in the basket, bike closer to home and return it. And don’t worry about riding in traffic and getting run over by a car…there are lots of bike paths and it’s legal to ride on the sidewalks here (and you get NO extra points for running people down). 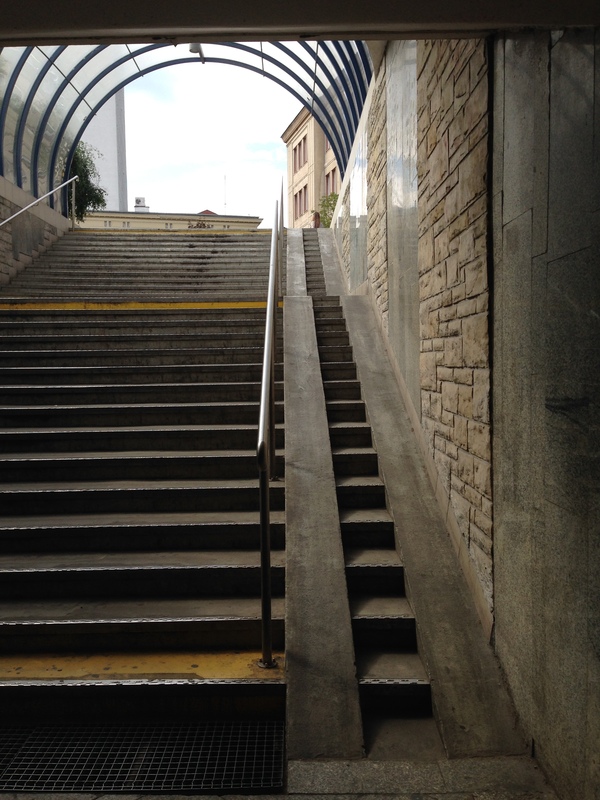 And if you have to go down any stairs — like to get to the walkways along the river or into the tunnels that run under the traffic circles like in the picture above — there are ramps built along the sides just for the bikes! How cool is that?